A fairy tale filled with magic, love, and beauty. Adam Sklute’s critically acclaimed 2015 production makes it’s triumphant return to the Utah stage. 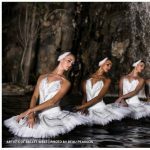 A true test of a ballet company’s artistic depth, Swan Lake is the story of a sad prince, an evil sorcerer, and a beautiful woman turned swan. With heart-wrenching and glorious music by Tchaikovsky, this ballet is a feast for the senses, and a must-see whether you are an aficionado or a newcomer to ballet. Run time: approximately 2 hours including a 20 minute intermission (subject to change).